is an original many-member vocal ensemble accompanied by a violin, keyboards, double-bass, drums and computer-generated sounds. 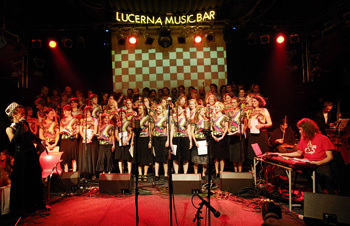 The core of the ensemble is composed of four people: Petr Wajsar, who composes the music which can be described as contemporary choral disco-rap and is as original and eklectic as the description suggests; Ester Kočičková, who provides humorous, double-entendre or nonsense lyrics and performs them as the leader and soloist; Lukáš Prchal, who conducts the whole show in a precise, yet show-like manner; and Šimi, who is the father of the philosophical idea of this audio-visual performance. The ensemble has recorded a live DVD at the Prague Lucerna Bar in 2007.